Size: Finished sq. measures 7 inches. Designers note: I used the basic granny square with ww and an H hook. I did six rounds and it made 7 inches ... you can make it larger if you like. With blue yarn, crochet a basic granny square in size needed. Star: With H hook and white yarn, ch 3 and s/s in first ch. to make ring. Ch 1. and sc 5 times in the ring, dont join. Sc 3 times in each sc making 15 sc. *ch 6 a little loosely and s/s in second ch from hook. sc in next ch, hdc in next ch, dc in next ch, triple crochet in next chain and in base of the beginning chain. Skip two sc , sc in next sc and repeat from * around until you have the five points and then join to first sc and finish off. Use F hook and join the red yarn in between any two points and sc in blo around the star, working 2 or 3 sc at the tip of each point and finish off. 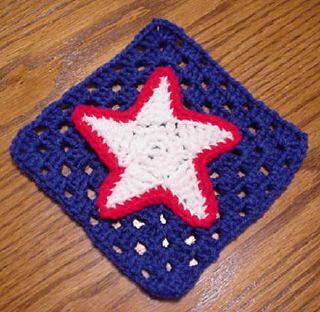 I used transparent thread to sew it on the square......no need to weave in the ends if they are secure....just tuck them in the back of the star where they wont show.